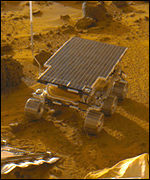 Sojourner was the first roving vehicle to explore the surface of Mars. It was carried by Mars Pathfinder, weighed 10 kilograms (22 pounds), and sent back its last transmission on September 27, 1997. Sojouner traveled a total of about 100 meters (328 feet) in 230 commanded maneuvers, performed more than 16 chemical analyses of rocks and soil, carried out soil mechanics and technology experiments, and explored about 250 square meters (2691 square feet) of the Martian surface.